Oleeva® Clear is a self-adhesive flexible and washable scar product that is applicable on both old and new scars. You can purchase this clear sheet in several sizes, but as you increase in size, the cost of the product significantly increases as well. This product can cost you anywhere from $22-&168, depending on the size and coverage you are looking for. According to the manufacturer, you should not wear this product under clothing as some garments may catch the fabric and make it unstick. If you are interested in a product that is applicable with clothing, check out the Oleeva® Fabric option. Oleeva® Clear does not provide a directions of use or ingredients list for this product on the manufacturers website and there is no information suggesting this adhesive is comprised of 100% silicone. Silicone has been shown to improve the look and feel of scars in just weeks, if results occur. Although cost and ingredients are a key factor when electing a scar product, you will also want to consider its effectiveness. 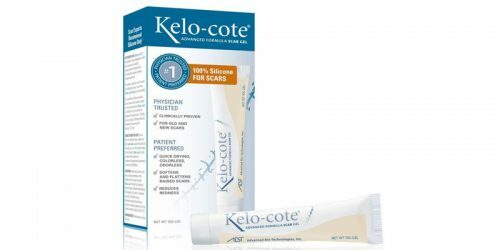 You will want to find a product that is promoted for all scar types including Keloid scars. Luckily, Oleeva® Clear is applicable on Keloids. Oleeva® Clear varies in sizes and cost. This product can go from being affordable to very expensive. However, you can reuse this product after washing it. However, it is not recommended for use under clothing, which may be troublesome for some customers. The manufacturer’s solution is to elect a completely different option if you decide you need to wear the adhesive under clothes. To see how Oleeva® Clear compared, refer to the grid below.